WASHINGTON (AP) â€” Several thousand demonstrators on Monday urged Congress to pass legislation to reduce greenhouse gases, and they targeted the government’s own Capitol power plant as a symbol of the problem. Despite attempts by lawmakers to clean up the power plant in southeast Washington, it still burns coal and accounts for a third of the legislative branch’s greenhouse gas emissions. 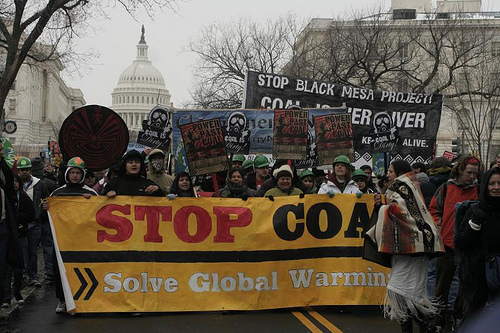 The group met about a dozen counter-demonstrators who held signs reading: “Our economy runs on coal.” The counter-demonstrators argued that coal is affordable and that renewable alternatives to coal-fired power plants won’t meet a growing demand for electricity. The Capitol power plant hasn’t generated electricity since 1952, but it does provide steam for heating and chilled water for cooling buildings within the Capitol complex. Del. Eleanor Holmes Norton, the city’s nonvoting member of Congress, said she’s been fighting against the power plant since taking office nearly two decades ago. “It has poisoned untold numbers of people who live in the District of Columbia,” she said. Norton and others at the rally said they were encouraged by House Speaker Nancy Pelosi and Senate Majority Leader Harry Reid who last week called for converting the plant entirely to natural gas in a letter to the Architect of the Capitol, which oversees the maintenance and operation of the Capitol Complex. The protest on energy and climate comes as Washington digs out from its largest snowfall of the season. Organizers note that climate change causes more extreme weather, and they say the issue is important enough that people are willing to brave the cold. There is an article in the LA Times today about a large gold mine in SE Alaska that proposes to dispose of tailings in a lake. The article says the plan went forward after regulatory changes made by the Bush administration in 2004. Do you know anything about this? Are these the same rules, written for the Appalachian coal mining industry in response to the Hayden rulings, which defines mining spoil as fill? Apparently, the 9th Circuit found the Alaska proposal in violation of the Clean Water Act. That ruling was appealed and it is going to the Supreme Court this spring. I always said there is no way that mountaintop removal mining could happen out West. The courts, especially the 9th, wouldn’t allow it. Nor, for that matter, would westerners. What about precedent given the difference between 4th and 9th Circuit decisions? Has this been noted by anyone? Does the 9thâ€™s ruling overturn or place in question the Bush regulatory changes?